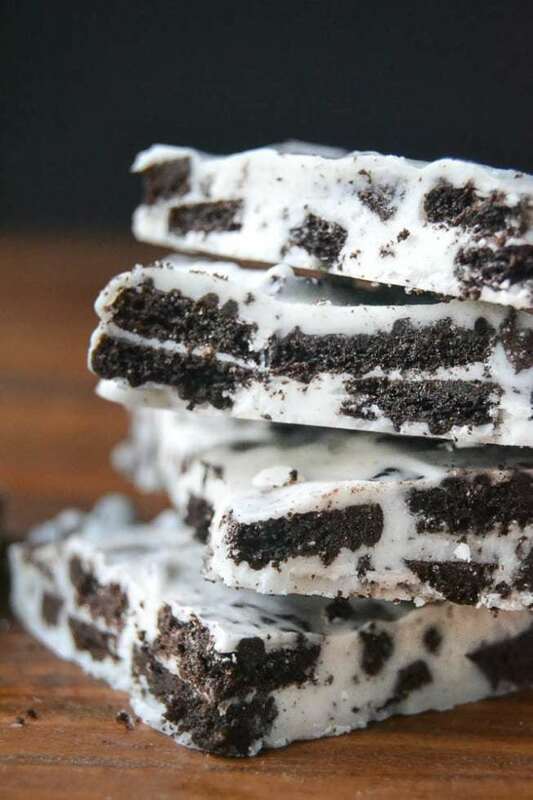 Cookies and Cream Bark. Just two ingredients and a few minutes is all it takes to make one of the tastiest and most giftable desserts around. Line a baking sheet with parchment or waxed paper. If you are using a bar of candy coating, chop it in small pieces. Put the coating, or the chips, in a microwave safe bowl and microwave for one minute. Stir the chocolate and then microwave again in very short 15 second bursts to completely melt it. Stir in between and let the heat in the bowl do some of the work. Don't over do the microwave or the chocolate will seize up into a solid mass. Keep stirring until all the little lumps are melted. Gently mix in the chopped cookies. I like to do this with a large silicone 'spoonula' and I fold them in so they don't get crushed. Immediately turn the mixture out onto the cookie sheet and spread it out as evenly as you can to a layer approximately 1/4" thick. It doesn't have to be completely smooth, the nubbly appearance of the cookies poking through is fine! Let the bark set up at room temperature, or chill it in the refrigerator. It will be easier to cut if it is not cold. Cut it into squares, or irregular pieces.